For those who are fascinated by the types of use one can obtain with a GoPro camera, you can now add working with man’s best friend to the list. The Fetch dog harness is the latest accessory to showcase your dog-on-the-go, whether he’s playing ‘go fetch,’ hunting, exploring or even swimming! GoPro has made it very easy for you to capture the world from from your pooch's point of view. The device features two mounting locations for a variety of perspectives: the chest, for bone-chewing, digging and front-paw action, and the back, for over-the-head shots of running, jumping, fetch and more. Made of washable, water-friendly and durable material, your pet can swim, play and get dirty without a worry. Soft, padded construction keeps you pet comfortable. Fully adjustable to fit small, medium and large breed dogs from 15 to 120 lbs (7 to 54 kg). Chest mount is removable for smaller-sized dogs. The Fetch harness enables dog owners to document a range of pet activities on land or in water. Mud, snow, water and woods are no match for Fetch – the water-friendly mount holds up to the elements and can be machine or hand-washed to keep it clean. An included camera tether ensures that the GoPro stays attached, no matter what type of play the dog engages in. Kurt Gies of Philadelphia found a unique way to make his dog Roo instrumental in capturing his marriage proposal to his finance, with this device. Gies told NBC10/WCAU that he and now-fiancée Amanda Wiseman already had planned a trip to the beach where they met in Ocean City, N.J. (awww), and he wanted to think of a creative way to propose, but still make sure she was totally surprised. He knew he wanted the couple’s dog Roo, whom they had rescued from a Philadelphia shelter two years ago (double awwww), to be involved in the special moment somehow. So he mounted the GoPro on Roo’s harness and tried to play it cool until the perfect moment arrived. Here’s the touching video production that was the result of this dog-master collaboration. 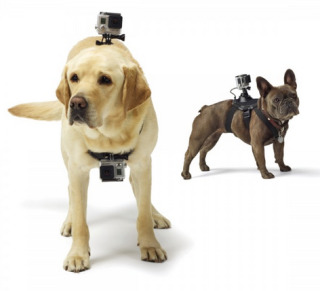 To learn more about the Fetch dog harness go visit GoPro animal channels including Furry Friends and Wild Animals to view more playful and entertaining dog camera-shooting content. Fetch is available now for $59.99 on gopro.com and on Amazon.com for even less. 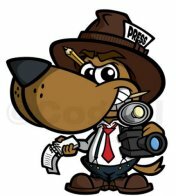 And don’t forget to pay your dog with some extra treats for all his hard camera work!